Ionized acidic water is a non-toxic green cleaning and beauty solution that is great for your health, your wallet, and the environment. It is the byproduct of ionized alkaline water, and is made with a water ionizer for pennies on the gallon. Ionized Acid Water is currently used all over the world to treat a multitude of skin disorders through its sterilizing and cleansing properties. The effectiveness of Chanson ionized acid water can be dramatic even with fluctuations in the percentages of the above components. Due to the synergistic effect, the water produces similar results in many different source water supplies. We use two strengths of acid water. One is mild (4-5 pH), and the other is strong (2.7 –3.5 pH). Mild is great for all skin care, while strong is excellent for cleaning and killing bacteria. If in doubt, use the strong, and switch to mild if irritation occurs. Ionized acidic water is great for the skin because the skin is naturally an acidic organ (this slight acidity of 5.5 pH helps our body fight off bacteria). People who regularly use acidic water to wash their bodies tend to have more youthful and vibrant looking complexion than those who use neutral hard water which disrupts the natural pH balance. In Japanese hospitals acidic water is used to help sterilize wounds, treat diabetic ulcers and keep hospitals clear of infectious bacteria and viruses. Use to lessen the appearance of lines and wrinkles on the face. Actually speeds skin renewal process! Use as a skin toner. Use to lessen the appearance of age spots. Use for dry skin patches or rough skin. Use to replace expensive skin moisturizers and creams. Use as a hair conditioner. Try on skin for Eczema. Spritz three times a day and let air dry. Try on skin for Psoriasis. Try on skin for Rosacea. Try on hair for dandruff. Spritz on after shampoo and let air dry. Use for adult and teenage skin irritations of every type. Spritz on after washing and let air dry. Use to spray in shoes to disinfect and deodorize. Use in place of deodorant. Pour into bath water to soften skin. This will also help the bath water heat quickly, and make the tub easier to clean since it is difficult for scale to adhere to the tub. Try for relief of Athletes Foot. Try for relief of Jockitch. Try for female yeast conditions and other female issues. Rinse after swimming to remove any sea salts and/or chlorines on skin. Add to a sick childs bathwater to kill germs and viruses. Sunburns – may help to relieve inflammation and accelerate recovery. Chapped hands – may help to prevent chapped hands as well as speed recovery from chapping. Insect bites – may help to provide relief from the itch or sting of mosquito and bug bites. Bruises and sprains – accelerates recovery when applied topically. Use as a gargle for a sore throat. Try snorting or putting in droppers for nasal congestion and sinus relief. Try spritzing on canker sores/cold sores. Use to stop & slow bleeding in minor cuts. Use in doctor and dentist office for cleaning and antibacterial. Ionized acidic water can replace up to 50% of toxic household cleaners! Use to spray directly in refrigerator for foul odors. Use to spray on carpets and rubber bathtub mats. Use for cleaning wood floors (a light mist is all that is needed). Use to clean dirt and grime all over the house (removes fingerprints from drywall), etc. Use to sanitize the interior of your washer and dryer. Use on household sponges to extend their life and prevent foul odors. Use to spray into laundry baskets to kill mold and fungi. Use to sanitize computer keyboards (light spritz). Use on doorknobs and handles to disinfect them. Add a cupful to the washer to make whites brighter and towels fluffier. Makes a great fabric, linen and bedding deodorizer. Try as a fabric refresher instead of Febreeze by adding a few drops of the essential oil(s) of your choice. Works as an air deodorizer. Makes a great all-natural air freshener if you add a few drops of the essential oils of your choice. Wash and clean dishes with it. Removes coffee and tea stains left on cups. Will remove tough stains from floor tiles and carpets. Try for laundry stain removal and spot cleaning. Wash cars and motorcycles for easy removal of tough stains and greases. Soak pots and pans overnight. 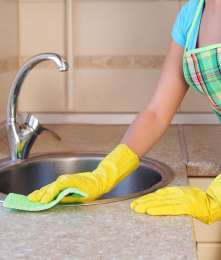 Rinsing dishcloths with acidic water may help slow bacterial growth and odors. Use to remove strong odors from your hands (such as garlic and onion). Use it to water potted and outdoor plants and flowers to promote growth. Use in hot tubs for quicker heating, easier cleaning, and no smell when reheating. Use to boil eggs. Even when the eggs crack, the contents will stay inside, and it makes the shell easier to peel. Use to cook beans. It will particularly help kidney beans and peas cook quickly, with their natural colors intact. Use to rinse fish. It will tighten the bodies of some fish and reduce the odor. Use in cat litter boxes to kill odors and bacteria. Use on animals skin for any kind of skin issue like rash or dry skin. Slows bleeding of minor cuts on animals. Can be sprayed in your dog or cats mouth to reduce bad breath. Wash animals with it to increase the shinyness of their coat. Safe for cleaning animal cages/tanks/terrariums. Spray on fur to reduce odors. The best part of all is the safety factor. This water is safe. Even the Hypochlorous acid is EPA approved for food and human contact as well as an FDA approved food grade sanitizer. You can even drink it although we DON’T recommend it. Chanson Ionized Acid Water can reduce the carbon footprint of the home dramatically by reducing the amount of chemicals and cleaners needed. In bottled form, we have seen Acid Water retain its strength for up to 90 days. However, you can count on the full strength of the acid water for at least 30 days. We suggest two different bottle types at home for designated uses. HDPE plastic spray bottles 24oz with trigger sprayer. These are milky white cleaning bottles designated for cleaning and disinfecting. And while all of these wonderful uses for Acid Water exist, you may want to know that most ionizer brands can not make strong acid water! However, the Chanson Miracle has been 3rd party lab tested and verified to be able to make strong acid water that can disinfect on contact in 70% of all water sources. We tested it on both ecoli and staph germs with outstanding results! What about strong acid water for the other 30% of the country with soft water? Ronnie Ruiz designed the Miracle M.A.X. with superior Acid Water capabilities. Our Himalayan Rock Salt injection can make strong disinfecting acid water even in the softest water sources. Check out Chanson ionized acidic water videos!